Starting today, Jason Reitman's Up in the Air is now playing in limited theaters. It'll expand nationwide on Christmas Day, so if you haven't seen it yet, be sure to see it then. A few weeks back, Paramount invited me on a special flight hosted by American Airlines in promotion of the film. Not only was it a private flight with American, but we would see the film on the plane (my third time seeing it), interview Anna Kendrick, and get a live performance from Sad Brad, who's song "Help Yourself" can be heard in the second half of the film. It was one of the best flying experiences I've ever had and one of the coolest trips I've ever been on! The flight was from New York (JFK) to Los Angeles and was a good six hours from start to finish (which gave us just about enough time to get everything done). I was joined by a handful of other journalists, most of whom worked for local TV stations around the US, however there were a few other bloggers like Jeremy Horn, aka The Product Guy, and Greg Ellwood from HitFix. It kicked off with a screening of Up in the Air on the plane, which was cool but I'm glad I had already seen it. I can barely stand watching movies on those little airplane TVs, especially if they look as great as Up in the Air does (compliments to Eric Steelberg). Half-way through, the audio gets scratchy and then the video jumps. That was because the battery died on the camera and we had to pick it up again after it was replaced. Apologies for that. I tried to cover topics that you don't normally hear actors get asked in interviews, especially because she's got so much to talk about! If you follow me on Twitter (@firstshowing) you probably already saw me talking about the flight or saw photos from it (on Twitpic). We had in-flight wifi internet (which American offers), which meant I could update everyone live as it was happening on the plane (how cool is that?). Additionally, the American guys were tweeting about it as well, and you can find a recap of the event by searching for the hash tag #UITA. It was pretty crazy being able to walk around the plane and chat with journalists, American Airline reps, Anna, and others. Even though I fly quite a bit, this was still one of the best flights I've been on, that's for sure! 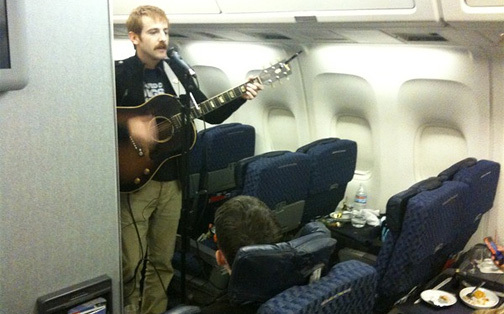 Lastly, before we were served an airline dinner, Chicago-based musician Sad Brad Smith performed three songs right on the plane for us (see the photo below). The first one was "Help Yourself", which is one of my favorite songs from the film anyway, and the others were his own songs. I don't know about everyone else, but usually you only see people performing "concerts" on a plane in the movies. This time I was actually on the plane and it was for a movie. Even though the sound quality wasn't top notch, it was still pretty damn cool seeing him play songs for us right there in the aisle. He's an awesome musician, too, check him out. This was easily one of the coolest promos I've been a part of and I've really got to hand it to Paramount and American Airlines for doing such a great job coordinating this whole thing. This couldn't have been a more perfect idea. I had even asked to interview Jason Reitman on a plane a few days earlier (he was in St. Louis and couldn't make it on this flight) so it was actually something I had wanted to do already. They just took my idea, spruced it up with some extra amenities, and took us all for the ride of our lives. This is the kind of treatment a film like Up in the Air deserves. Be sure to see it sometime this month, you will love it! I love it alex! keep em coming! Ha, awesome Scott Pilgrim shirt! That sounds like it might be the coolest promotion for a movie I've ever heard of. It's playing at a theater pretty close to me, after I get done seeing me some more Mystery Team I'm going to go check it out. A chick into the classics....awesome! Fun int. Alex! Damn thats awesome promoting! I am going to see it now. Even though I wasnt invited the fact that they take this seriously and sincerely want people to know the film, I want to see it. She's so cute and bubbly 😀 But yeah, I saw the pictures on your Twitter and was super jealous. I am a road warrior and really want to see this. I stayed at a Hilton last week which also promoted it - trailers on TV, key cards promoting it, etc. Just the clever promoting you described and I experience really make it one I want to see! Thanks, Alex! Im a former consultant so Im really looking forward to this movie. That looks like an awesome live performance. Thanks for sharing.